Deepwater Horizon oil rig exploded resulting in an uncontrolled release of oil into the ocean. Estimates now indicate that 1.5 million to 4.2 million gallons continue to flood into the Gulf on a daily basis totaling between 85.5 million and 239 million gallons with no end in sight. Superimposed on the threat of the oil, is the already more than one million gallons of toxic chemical dispersants that British Petroleum (BP) dumped into the Gulf to try and breakup the oil. These chemicals are being used in unprecedented amounts and in untested ways. One major concern is the impact of this crisis on wildlife in the Gulf of Mexico. Marine mammals are a particular concern because they serve as sentinels for human health and because they are key species for both the ocean ecosystem and coastal economies. Marine mammals are at risk in this crisis. For example, there is a resident population of about 1,600 sperm whales in the Gulf of Mexico. This population is endangered, as all sperm whales are, but this population is considered to be at particular risk because the size of the group is so small. Losing even a few whales will have dramatic population effects because individual whales take a long time to reach sexual maturity and then only produce a few calves over their lifetimes. The Gulf Oil spill is a specific threat to these sperm whales, because they occupy deeper waters and thus are much closer to the greatest amount of oil. Moreover, studies show that prior to the explosion, many sperm whales spent a lot of time near the Deepwater Horizon oil rig. In fact, a dead sperm whale has recently been discovered near the oil spill though the cause of death has not yet been reported. 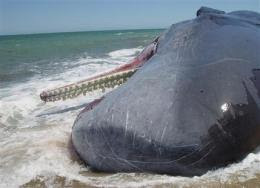 "TOXINS FOUND IN WHALES BODE ILL FOR HUMANS"